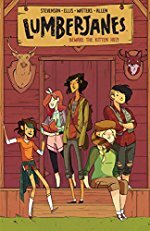 Volume 1 collects issues 1-4 of the popular and awesome Lumberjanes comic book, created by Noelle Stevenson, Grace Ellis, Shannon Watters, and Brooke A. Allen. Started reading this with my four-year-old daughter at bed time. It's a little scary in places, but she really loves it. What I love most about this so far is how it gives my daughter so many ideas about who to pretend to be while she's playing (it's usually Ripley, I get to be April). She's also started saying "Cool your jets!" This is one of the comics I do not read on public transit because I cannot be responsible for the random cooing that occurs over something so adorable. I liked it and so did my daughter. The art is expressive but relatively simple in a way I like. I actually had a little trouble following the plot though... Anyone else run into that? I definitely checked a few times to make sure I had actually bought volume 1, because it seemed like we were diving in midstream. Lumberjanes! I've been keeping up with it since the first issue (my husband saw it at the comic shop and though it'd be up my alley. He was very right.) It's true that it starts right in the middle and just kind of goes from there. I haven't followed enough comics from the first issue to know how standard that is, but they do a good job of knowing the characters from pretty early on.